Jorge Rivera returns to UFC...with his Clubbell! "Coach Sonnon, Any chance you could re-release your training protocol for Alberto Crane's fight with Kurt Pellegrino? I had bookmarked all the pages from your blog and was using them for something to work up to. Needless to say, I was disappointed when they were pulled off of the website. All things said and done, it was a great training protocol and I love to study it some more." Scott Sonnon received so many requests like this one above, so he decided to release to the public his training protocol for UFC fighters. Would you like to know how Alberto Crane trained for his fight? 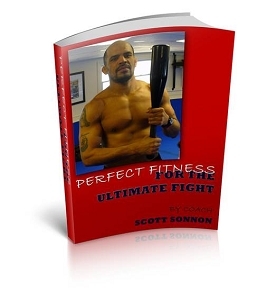 ORDER NOW and get the Perfect Fitness for the Ultimate Fight (194 pages PDF file) in your email box. NOTE: Please be sure to include your email address when ordering this product. When you have completed your order, and it has been processed, RMAX.tv Productions will send you an email, containing a link to your PDF file, to the address you have specified.